The birthplace of former US President Richard Nixon, this private estate in Orange County is draped in timeless elegance, set over nine acres of beautifully landscaped gardens. Colonnaded walkways, ornate architecture and a spectacular rose garden provide a magnificent backdrop for your wedding ceremony and portraits at the Richard Nixon Library, while its lavish East Room boasts an opulent wedding reception setting. The First Lady’s Rose Garden is the largest of its kind in Orange County and an idyllic setting to exchange vows with your loved one. The wide lawns can host up to 400 guests, with elegant white chairs provided in the rental fee, while the picturesque reflecting pool providing a captivating backdrop, surrounded by pepper trees. You can say “I do” under the steepled white gazebo which hosted Tricia Nixon’s own wedding at the White House Rose Garden in the early 1970s. There are plenty of beautiful spots to capture couple portraits, bridal party portraits and family formals around the gardens as your guests enjoy cocktail hour, with the sunset golden hour particularly impressive within the grounds of the Richard Nixon Library. Then step inside to the East Room (the only replica of the White House East Room), with stunning crystal chandeliers, gold Versailles chairs and decorative marble fireplaces. Italian silk adorns the walls, floor-to-ceiling windows offer stunning views over the gardens, while a wooden terrazzo floor provides the perfect setting for your wedding guests to dance well into the night. There are also a number of other spaces which you can utilize, including an indoor theater where you can screen personal movies or photos, as well as the opportunity to tour through the Richard Nixon Library’s historical exhibits. The Richard Nixon Library provides all catering, with menus customized specifically to each couple’s requests, as well as bar packages and all tableware. If you prefer a specific cultural element to your wedding, they also work with a number of Orange County’s top ethnic catering companies to create traditional feasts that satisfy your individual requests. 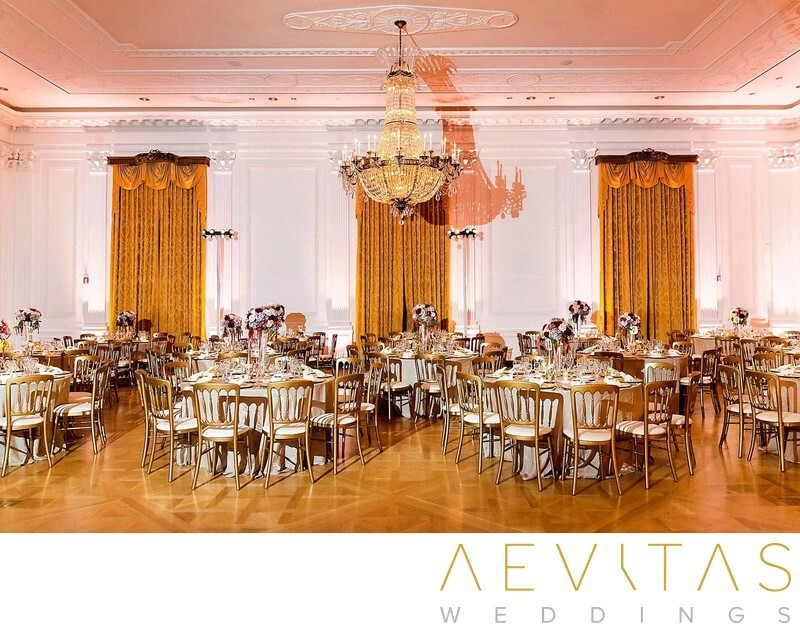 Their wedding coordinator will assist in creating a wedding day package that realizes all your dreams, while their expert service staff will ensure that your day runs as smoothly as possible. The Richard Nixon Library stands as one of Orange County’s most magnificent wedding venues, combining history, class and undeniable elegance.